Figure 1: William Holman Hunt, The Finding of the Saviour in the Temple, Wikimedia Commons. 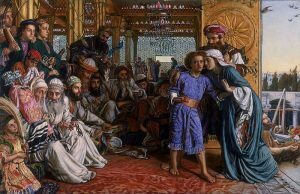 In 1860, the Pre-Raphaelite painter William Holman Hunt completed and exhibited his now-famous painting, The Finding of the Saviour in the Temple (Fig. 1). Hunt’s was one of the first attempts at a realistic, ethnographically and archaeologically accurate depiction of “The Finding in the Temple” from the Gospel of Luke. In the foreground, Mary and Joseph embrace the young Jesus Christ. They had lost him in Jerusalem and rediscovered him in a nearby temple discussing scripture with the Jewish Rabbis. Indeed, Dinah Craik was so struck by The Finding of the Saviour in the Temple that she felt compelled to write a poem to commemorate it. The poem, “Our Father’s Business: Holman Hunt’s Picture of ‘Christ in the Temple’,” is a devotional ode written in the first-person plural. It addresses and praises the young Jesus Christ—who is seen as wholly present and not simply reproduced in Holman Hunt’s painting. The speaker, who speaks on behalf of all Christians, glorifies the boy Christ and advocates for a renewed sense of Christian faith and duty. Craik had already written “Our Father’s Business” by the time she sent her brother his weekly mail on Sunday, April 15th, 1860, and it certainly did not spend much time on her desk after that. Sometime between April 10th and the end of the month, she sent it off to her friend and publisher, Alexander Macmillan. Macmillan must have thought it was a good poem because he published it the following month in Macmillan’s Magazine (May 1860). 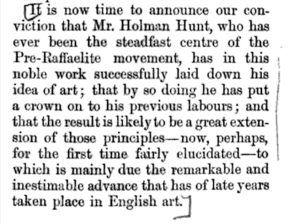 The painting could not be reproduced in the pages of Macmillan’s as it is here, but Craik’s poem is preceded by an anonymous introduction, elaborate description, and commentary on Hunt’s painting. This introduction concludes with a statement that seems to be written on behalf of Macmillan & Co.
For ease of reference, I’ve copied Craik’s poem “Our Father’s Business” (1860) below. Enjoy! Pure—as the pure in heart that shall see God. The Christ-like glory and the Christ-like doom. Have mercy on us, Jesus Christ, our Lord! Who offeredst up Thyself for all the world. Hidden with Thee in God, can ask or need. As zephyrs blow the winged dust away. Runs molten, and shall run—the Will of God. Craik, Dinah.“Our Father’s Business: Holman Hunt’s Picture of ‘Christ in the Temple’.” Macmillan’s Magazine, vol. II, no. VII (May 1860): 40–41, accessed 5 June 2017. Landow, George P. “The Finding of the Saviour in the Temple.” Replete with Meaning: William Holman Hunt and Typological Symbolism. New Haven: Yale UP, 2009, Victorian Web, accessed 5 June 2017. “Letter from Dinah Mulock Craik to Alexander Macmillan, April 1860,” Henry W. and Albert A. Berg Collection, Folder 67B2875, New York Public Library, Digital Dinah Craik on TAPAS, accessed 5 June 2017. Stephens, Frederic George. 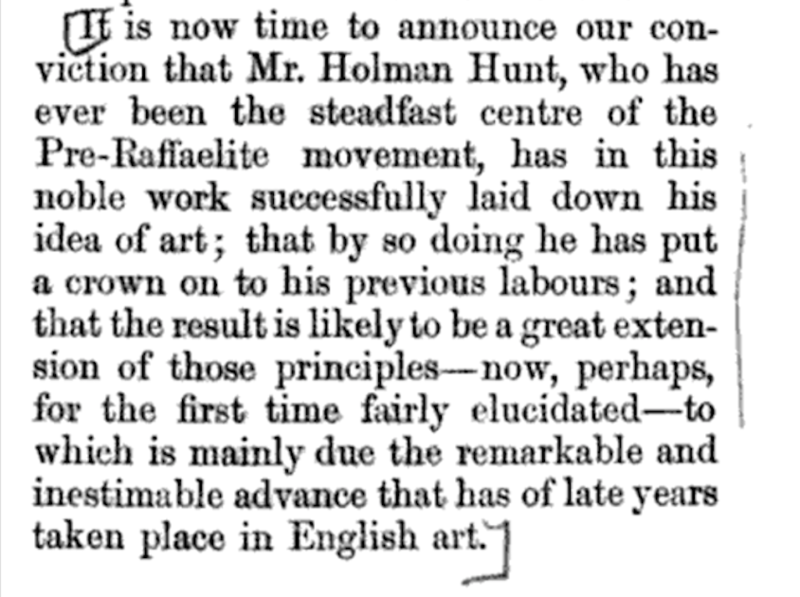 William Holman Hunt and His Works: A Memoir of the Artist’s Life with Descriptions of His Pictures. London: James Nisbet & Co, 1861, accessed 5 June 2017.